If you want to be an influencer, you must write. This is your manual. Tags: Writing, blogging, copywriting, content marketing, content creation, communication, book writing, website content. You want to write but you’re afraid to. You want to write but you don’t know where to start. You already write, but want to improve. You want to know what rules of writing to obey and which to break. 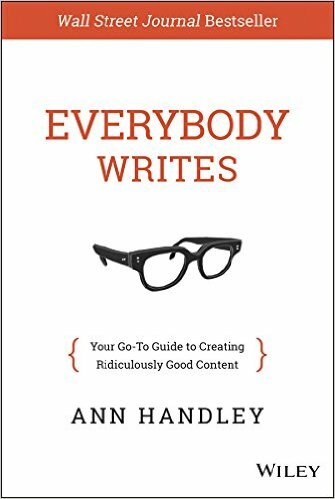 Ann Handley is one of the foremost minds when it comes to content marketing. She’s the Chief Content Officer for MarketingProfs where you can get great content, tutorials, and courses on how to become a better content marketer. She also co-wrote the best selling Content Rules: How to Create Killer Blogs, Podcasts, Videos, Ebooks, Webinars (and More) That Engage Customers and Ignite Your Business, another great book about content marketing. I started blogging around the year 2000, but it wasn’t until 2013 when I started writing for Forbes that I realized the power of writing. Since then I’ve written over 200 articles for Forbes, Entrepreneur, Mashable, TechCrunch, Fast Company, VentureBeat, the South China Morning Post, and several other pubs. Simply writing down my thoughts on marketing is the most powerful marketing tool I’ve ever possessed. Now I’m taking that to audio, video, and a variety of channels, but it all started with writing. You may think writing isn’t for you. Perhaps you don’t type quickly. Perhaps you’re uncertain about grammar, sentence structure, or punctuation. Get over it. Download a typing app to get better and faster. Use tools like Grammarly to check your grammar and other technical aspects of your writing. The great thing about writing is that unlike video or audio, it’s super easy to go back and fix it. I make tons of mistakes in my writing. Some of them I fix. Some I don’t care much about. This review has all sorts of technical problems and if I turned it in as a high school assignment it would be full of red marks. I don’t care. I care about communicating with my audience and making a connection. The rules are kind of arbitrary anyway. And that’s a valuable part of this book–it tells you what to pay attention to and what to ignore. The way you were taught to write probably made you so scared of violating rules that the result was you don’t write at all. This book will help you get rid of the writer’s block that built up in your head while you were a kid and will free you to become the writer you really are. Everybody writes. Everybody is a writer. Not everybody knows it yet.